Antoinette has shared how she uses the Mr. Clean Eraser in her home, and also at work. 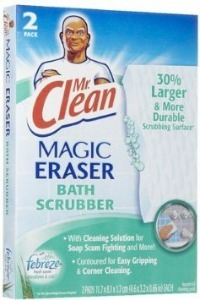 I really like and I’m very impressed with the Mr. Clean Magic Eraser. I bought my first one after a friend told me about how good they work. There had been some stained Kool-Aid marks on my counter since I bought my house. I had used everything on these marks to try to get them off, including Comet powder, S.O.S. pads, and bleach. When I bought the Magic Eraser that was the first thing I tried it on. I couldn’t believe it! It took the marks off without even any effort! I have since used it in my bathrooms and to get fingerprints and marks off the walls. We even have this dry erase board at work that we have to add new data to everyday, and when we would wipe the old data off, it was still always showing through. I took a Magic Eraser to work and it took all of it off! People at work would take turns trying it out! Two days later I went to work and couldn’t find it. Where could it be? Upon further observation I realized someone had torn it into pieces and threw it in the trash, probably not realizing what it was. I am now still using it to erase data on the board, BUT even though I saved two small torn pieces to do this, I hide it from everyone! Thanks Antoinette for sharing how you've successfully used the Mr. Clean Eraser in both your home and office. I love collecting uses for this product, because it seems to have so many. You can share your own uses and review of the Mr. Clean Magic Eraser here, or read even more uses and reviews that have already been submitted. Further, I know we all suffer from countertop stains. Click the link to read more tips for removing these stains, or share your own ideas and remedies as well! Join in and write your own page! It's easy to do. How? Simply click here to return to Magic Eraser. 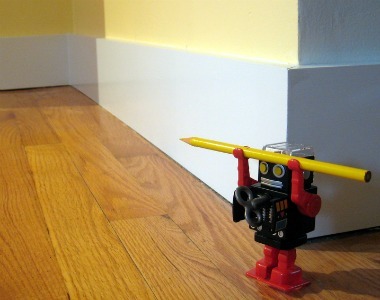 The Mr. Clean Eraser (or generic or other brands of it) can be used to clean lots of things on your walls. Yet another of these things it can clean are those stray pencil marks that somehow get on your wall (or perhaps it is more than just a few stray marks, but a child's masterpiece). You can read more tips on how to remove pencil marks all around your home, including from clothing, upholstery and carpet. ***Update: A reader, Karen, had this warning when using this product for pencil marks on your walls. SLN wrote in to share how she uses her Mr. Clean Eraser around her home. The Mr. Clean Magic Eraser is the best invention since sliced bread! There really is nothing that this eraser cant erase from your walls. You don't even have to scrub hard, just dampen the eraser a little bit and rub lightly. If you wet the sponge too much, then you will find that when you press it onto the wall to rub it will drip a white film that will run down the wall. The eraser also does a terrific job in removing soap scum from bath tubs, shower walls and tiles. However, don't use this eraser on dark colored walls. In fact it's best to only use them on white walls because they will leave a white film. They work best on glossy walls I find. Just do a small patch at first and wait until it dries. If you can see a white dull patch then the best way to wash the wall is to use the eraser, then go over it again with a damp white cloth to remove any film. They are pricey to buy, but the generic ones work just as well and are a lot cheaper. These are definitely a "must have" in everyones cleaning kit for their home. Thanks so much for sharing your tips for cleaning walls and other items in our home with this versatile cleaning product SLN. Thanks so much for the great tips! 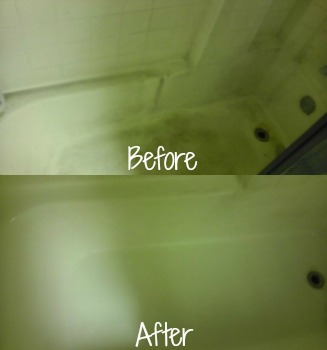 Kristin shared before and after pictures of her bathtub (see below) which she cleaned with two Magic Eraser Bath Scrubbers. She explained that the before picture shows about half a year's worth of soap scum, dirt, and who knows what other grunge. It appears to me that the "bath scrubbers" are basically the same as the original of this product, but are just a bit bigger, and have some cleaners embedded in them. I'd love to hear from others who've used this variation (or the kitchen scrubbers) to share if they're worth getting, or just to stick with the original version. I keep one in my bathtub and run it around the tub while I'm in it every few days. No ring around the tub! Is The Magic Eraser Safe For Ceramic Stove Top? First of all I just love your site. 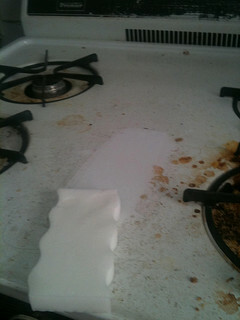 Question....can I use the Magic Eraser on a ceramic stove top or will it damage the surface? Hi Adela, thanks for asking me this question. My initial answer, in my mind, was yes, of course. But then, I thought, let's just check to find out for sure, since you're right, you wouldn't want to scratch the surface of your stove. I checked the Magic Eraser site and was actually quite disappointed that they had no information about what surfaces the product was safe for, versus not, since they suggest through their advertising that it's quite versatile (and I know from readers suggestions of what you can do with it that this is true). Most tiles are ceramic, and you can definitely use this product in your bathroom to clean up surfaces, they clearly suggest that in advertising. Therefore, my answer is yes, I think you can use this product on your ceramic stove top. In fact, there are many pictures of this exact use floating around (see the one above as an example). It's a great cooktop cleaner, especially for burned on and stuck on messes. That being said, if you're concerned about scratching it is prudent to test any product you use (including this one) in an inconspicuous area first before using it all over your stove top just to be on the safe side. I've answered this question as part of the cleaning questions section of the site. You can always ask your own questions, or see what else I've already answered at the link. In addition, I'd love to hear people's tips for cleaning your stove top here, or read others that have already been submitted. 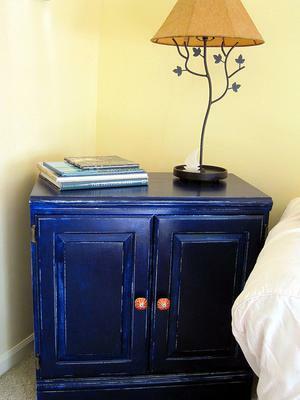 Ever scuffed the wall with your favorite piece of furniture and noticed that there was paint transfer onto the wood? Dampen the Magic Eraser and rub gently to remove the paint! I also use it to remove newspaper ink from my precious glass collectibles!! The Magic Eraser cleans bugs from my car grill, hood and windows like nothing I have ever used before. Bugs are the hardest thing I've ever had to clean. This product makes it super simple. Amazing. No additional cleaners necessary. Add a little water if necessary or if really dried on, wet a dryer sheet, use it on the dried bug area then go over it again with the Magic Eraser. You'll love the results! Thanks for the tip Tammie! I would be cautious with this product on any painted surface however, such as on the hood of your car. It is basically a scrubber, which is of course what gets off the bugs, but it can basically remove the clear coat and also the paint from your vehicle which is definitely not what you want. Don't use it on your hood - at least not on your paint. This is the equivalent of using 2000 grit sandpaper to remove residue. Very effective on hard surfaces but not anything with clear coat - you can go right through it. So just be careful with what surfaces you use the product on, and if there is any doubt in your mind test it in an inconspicuous location first before using it somewhere noticeable! Whenever I play golf I always collect lost golf balls from bushes, water, woods, etc. 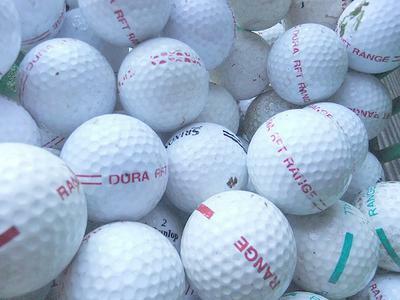 As a result I end up with thousands of balls a year, many of which are scuffed up, off color, dirty. I've tried several methods over the years to clean them up. The Magic Eraser has proven to be the best ever. My golf balls now glow and have been mistaken for new balls by many different people. I cannot imagine cleaning a sink full of golf balls without my Magic Eraser. I tried everything to clean the mildew off of my boat cushions and could not get them cleaned. I was ready to give up. I tried Mr Clean Eraser and to my shock the eraser removed all the mildew. It also removed the mildew on my siding. It was so easy. 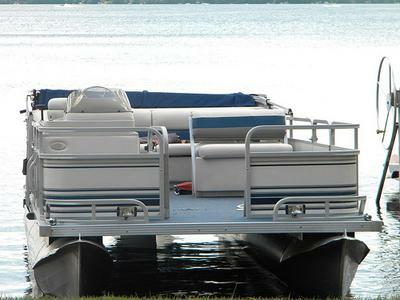 I used the home pro extra power version on the mildew on the vinyl boat seats in our pontoon boat, fantastic! They are white and took it off quickly. My neighbors old boat was covered in it and hers then looked like a new boat as well. 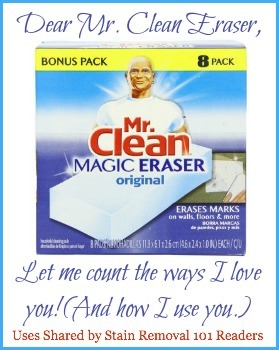 Janet has shared what her favorite all purpose cleaner is -- the Mr. Clean Eraser. When it comes to all purpose cleaners I really dislike sprays because they can be hard to control and it's easy to use too much. Whenever I need to clean a surface like a table or floor I use this eraser. It's probably the most innovative product for cleaning materials in the last ten years. I just wet it with a bit of water, go to the object I need to clean, and rub. 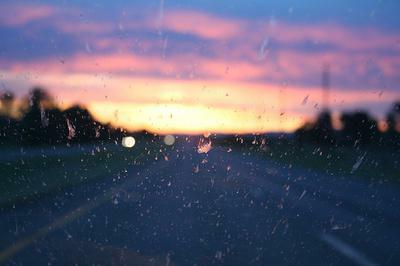 The dirt, debris, scuff marks, or any other unwanted specks just come right off. I've used it on porcelain, linoleum, wood, marble, tile, and glass. I haven't found it to discolor anything, or warp what I'm cleaning in any way. It has no scent, so you don't have to worry about any artificial, chemical-ish smell. Possibly the only con to the Magic Eraser is that it can take some elbow grease to get tough marks off, but they eventually give way and disappear. And the best part is they are available at almost any store that sells household cleaners, they come about 3-5 in a pack, and just one sponge can last about a month or two. Thanks Janet for sharing your review of the Mr. Clean Eraser. Lots of people love this product, since it is great for both quick touch ups and deep cleaning. I will note that I recently did some research into whether using this product on linoleum is safe. You can read my cautions for cleaning floor linoleum with a magic eraser here. So, what is your favorite all purpose cleaner? You can share your general purpose cleaner review here, or read other reviews that have already been submitted. I use the eraser on my stainless steel appliances. After using it I use a wet towel to remove any left-over residue and then use a dry towel to buff. Works great! 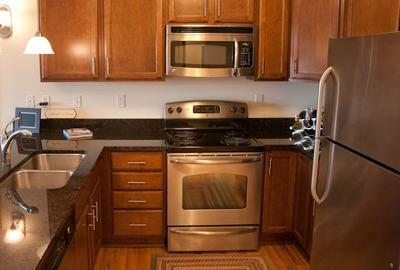 I used it on my stainless steel microwave and stove and cannot believe the shine! For occasional stains and scuffs, as long as you used light pressure and went with the grain of the metal this should be alright, but stainless steel appliances can actually get scratched and dulled, and since these appliances are expensive you should always use caution! I would strongly suggest doing this infrequently, and also test first in an inconspicuous place. In addition, over time the dulling effect may be more noticeable as well. Just be careful, but I'm glad it has worked well for both these ladies! If you need something more frequently, check out these stainless steel cleaner reviews! Cleaned Blood From Carpet - Who Knew? The Magic Eraser cleaned blood out of my carpet, with no signs left afterward it was ever there. My husband broke his toe and I said, well lets try it. I was amazed. It did not leave any residue or bleach out look at all. Well that is certainly an unusual use for this product that I wouldn't have expected. Normally, you think of using one of these sponge erasers on hard surfaces, but I am glad it worked for you! 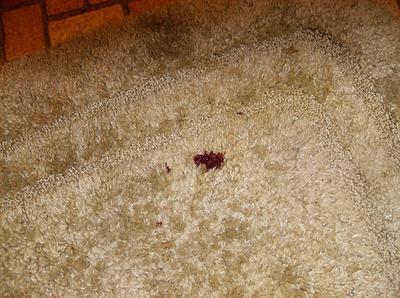 If you need more ideas and tips for removing blood from carpet click here. Megan has shared her experience of the first time she used the Mr. Clean Eraser in her home. I was incredibly impressed the first time I used this product in my home, in my bathroom. Actually, a teacher at my child’s school suggested it to me. So, I went to Walmart and bought one, and the same day I took the eraser to the bathroom to do a long put off cleaning project of cleaning the bathtub. With this tool I finished a lot quicker than I expected. The mildew was very bad all along the caulk of the tub and fixtures. The bottom of the tub and shower head was also covered with rust due to the hard water. I had been putting it off because I didn't think it was really possible to get the tub clean again, and I didn't want to waste my time. When using the eraser there was virtually no odor to it. It not only removed the mildew with surprising ease, but also took care of the rust along the tub and fixtures. I was amazed. Since then I have recommended this product many times, and believe it is definitely worth the money! Overall I found the Mr. Clean Eraser to be amazing. Thanks Megan for sharing how this product cleaned up your bathtub. Does anyone else have their own stories to share about what this product has cleaned up in their homes? If so, you can share your review and experiences here, or read other uses and reviews already submitted. That is true, so you have to be careful! That's a great point Marsha. If you've got kids, this is a must have staple in your home. Life saver!! The Mr. Clean Eraser seems to take the finish off of wooden toilet seats and fiberglass/acrylic bathtubs and surrounds over time. When I first started using it 7 years ago, it was so nice. Now I have had to change toilet seats. It no longer cleans the bathtub and shower surround and they are getting dull and stained. Any ideas for cleaning/restoring a shine on this type of tub and surround? I wanted to know why it was so wonderful when it came out. It still cleans almost as well, but every time I use it, it falls apart! Use it once and you lose half of it and it really does not clean as well as when it first came out. I have switched to different cleaners, sadly. Should have kept up your good product! You could have made millions! will it work on microfiber furniture? Will they work on microfiber furniture? My response to this question is basically the same as when a reader above shared that it worked well for cleaning blood stains out of carpet. I said, basically, good for you, but I'm rather surprised. This product really works best on hard surfaces, not on fibers, so although results may vary I would suggest trying a different stain removal method for fibers before relying on a magic eraser. In addition, depending on how thin the fabric was, it might even wear a hole in it! That wouldn't be good! We moved into a house where the previous owners smoked and no amount of anything would clean the dingy walls. The magic eraser was fairly new on the market so I thought I'd try it to clean the Koolaid off my counters, which it did, and when I got home from work my daughter had cleaned the kitchen walls with the sponge and they were so bright and clean I immediately went out and bought more so we could do the rest of the house. I always recommend these to people. I've been using these since day one. I can't live without them. I wish they lasted longer but they are magic. My favorite use is in the shower. I use shampoo and an eraser to keep my shower sparkling clean. If shampoo will take the styling products out of your hair they will certainly take the soap scum and grime out of there as well. definitely get the generic version! Moved into new house - these are a God-send!! Cleaning metal window frames, shower, plantation shutters, everything! Gently though. Does remove paint and shininess of some things. Generic is the way to go! I had to have construction done in my house and greasy oil from one of there machines leaked on my walls and baseboards. It took it off in seconds. I also backed up into my daughter's little black car.... mine is white. It left white paint scuffs on her bumper. It came off with no effort. You do have to be careful not to push hard on painted walls and things like that. Where can I find in South Africa? Please can you help, where can I get Mr Clean in South Africa? I bought some when I was in Canada, cannot get anything in this country that cleans so well, couldn't believe my oven after I used it. Plus my kitchen tops etc. I use magic eraser to clean sneakers. Gets the scuff off quickly and easily! I use Mr Clean Magic Eraser dry (never used) to clean my lamp shades, it works great. Do not use wet though. Woot woot! It works great! I don't know what it is but there are these weird funky marks on our kitchen floor where the dog's food and water bowls are. I've scrubbed and scrubbed to get rid of the marks but to no avail. Picked up a Mr. Clean sponge and barely wiped and woot! woot! Funky marks are gone. I've also discovered that there are times when using it wet is better than dry. On my walls I use it slightly damp. On the kitchen floor I used it dry. I've yet to have issues with scratching or paint removal. My daughter loves sharpie markers. The magic eraser took it right out of our micro fiber sofa cushion. We use the erasers to clean our sneakers too. I have used lots of products and I haven't found anything like Mr Clean Eraser. I don't use anything but these, I keep them on hand all the time!! I have an old linoleum floor that has become very porous over the years and always looks dirty even after I mop. I have tried everything to steam, bleach, you name it. The thing that makes it look the best is when I use Magic Eraser. I love them! I clean houses with my cousin and we use Magic Erasers and a little bit of Dawn on showers and tubs. It will take all the soap scum off and leaves the glass doors clean. We use it in just about every area of the house. I absolutely LOVE Magic Eraser. But I made the mistake of using it on a $3,000 leather recliner. It immediately started taking the dirt and grime off, but it also took off the pigment of the leather. As some people have warned, it IS minutely abrasive. It's like fine sand paper. I believe I looked it up and it's made of pumice.